A retired NASA astronaut died Sunday from injuries he received in a Pensacola Beach jet ski accident. Captain Alan Poindexter, 50, was jet skiing with his two sons near Little Sabine Bay about 1:30 Sunday afternoon. Poindexter and one of his sons, age 21, were sitting still in the water on a jet ski when his other son accidentally came barreling into him on a second jet ski, according to reports. He was airlifted by LifeFlight to Baptist Hospital where he died from his injuries. Poindexter’s wife is formerly of Gulf Breeze. He was a graduate of then Pensacola Junior College and Georgia Tech. 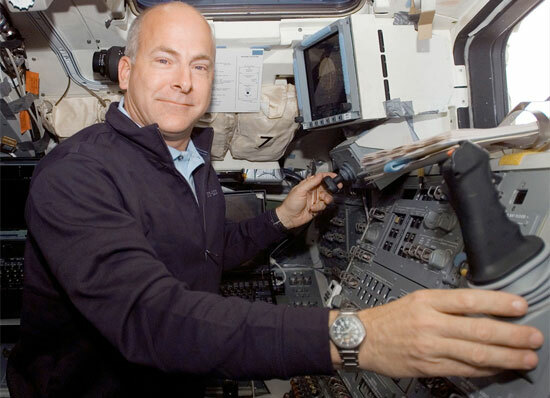 He flew numerous space shuttle missions, spending nearly 28 total days in space before he retired from NASA in 2010. In 2008, he was the pilot on the STS-122 space shuttle mission to deliver and install the European Space Agency’s Columbus laboratory to the International Space Station. 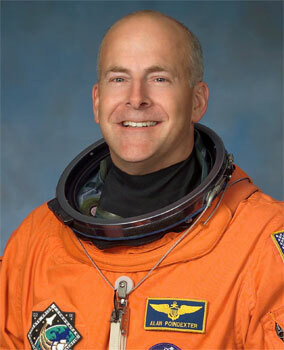 In 2010, he was the commander for STS-131, a resupply mission to the station that delivered more than 13,000 pounds of hardware and equipment. During his career, Poindexter was awarded the Defense Meritorious Service Medal, NASA Aviation Safety Award, Navy and Marine Corps Commendation Medal with Combat V, Navy and Marine Corps Achievement Medal, various other service awards. Pictured top: Astronaut Alan Poindexter works on the aft flight deck of space shuttle Atlantis during his first spaceflight in 2008. Such a tragic end for one with a life of major accomplishments. I hope that his son understands that it was accident and is able move forward without blaming himself. Just reading this story so sad specially for the son. We do not know when we go I remember years ago family friends were swimming in Germany in a lake. Father and daughter were playing around in the water and as the 10 year old daughter pushed him under water, the father never came up again. He suffered a heart attack. My mother died in a car accident caused by some one else. But before the accident happened, my mother asked my dad to turn around, as we were running very late for our appointment to our homeopath. As we left for the journey very early in the morning (we had 200 km to drive), to our surprise the streets were full of snow. It snowed during the night so heavy and of course our journey took longer. So – my dad did not turn around and then we had a terrible car accident and my mother was instantly dead, leaving her 5 children behind, all between 14 and 20 and her husband. I know one wishes sooooo much to be able to turn it back but the naked reality is life goes on and it is damn hard at first. Today I have a much deeper understanding I had messages from my mother twice and I realize it was her time. We all decide when we come and when we go. There are no coincidences ever and everything is according to plan. It is nobody’s fault. My heart is with the family and with the son. God bless you Lisa <3 Praying for your boys and your families. As an interested person in NASA works, especially Space Shuttle programme, this announcement really hits me. Just had to watch Alan’s really soft landing of “Discovery” of 2010 a few times. A really tragical accident – god bless him and his family, where I send my condolences to. The end of life puts the longest life on par with the shortest…….Death becomes tragic only by the retribution, if any, that follows it. They, then, who are destined to die need not inquire as to what death they are to die, but into what place death will usher them.Costantine. This young man, though heart broken can know with confidence that his Dad would not want him to carry this load by himself, if he could he would take all the burden on himself in a second. Thats the kind of man he was, and I’m confident that is the kind of men he raised. My prayer for you and you’re family is that you all can draw on the strengh of God in your time of loss. My heart goes out to you all. One of a few who could say they have. A legend of his time in his own way. RIP and prayers to the family! While Capt. Poindexter was a young man and left us too soon, he is the type of role model that filled my childhood. The Astronauts of days gone by and men like this were my ambition and the stuff dreams are made of. It is sad to hear of any astronauts passing. Anyone who was ever a little boy and wanted to be an astronaut knows what I mean. he was just 7 when they landed on the moon, I wonder how that motivated him? We are so saddened by your family’s loss. Our prayers are with you. Omg! Prayers for the son that ran him over. That will be impossible to recover from. God be with the Poindexter family. Our prayers are lifted up for all of you. Such a sad and tragic story. Praying for the family. Oh wow…how awful. Praying for this family and especially for the son. How very sad to hear of Allan Poindexter’s death…my prayers to the family…please pray for his son…I’m sure his heart is breaking for his dad and trying to cope being a part of the accident will last a life time…such a tragedy for this close family…may God’s mercy and grace cover this young man and his family in the days to come. That’s horrible for the family. Praying for peace for you. Another senseless death. My condolences to the family.